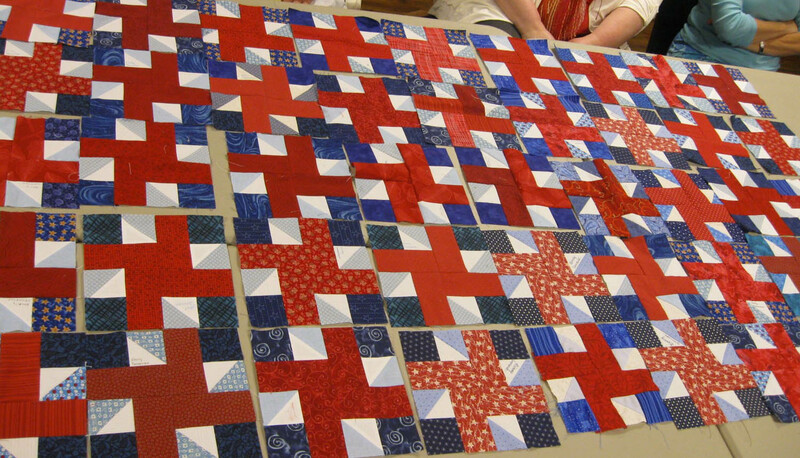 My wonderfully generous and talented quilt guild friends—the Choo Choo Quilters—completed 45 quilt blocks for the Quilts of Valor (QOV) 10th anniversary project. Thank you, friends! Quilts of Valor 8.5" quilt blocks. 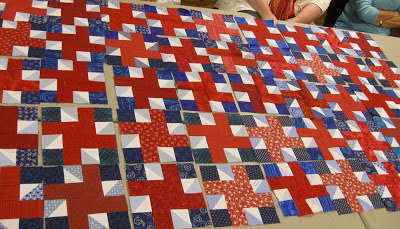 Last month, I requested assistance making these patriotic blocks so they could be mailed to Dennis, our Tennessee Region 8 rep, in time for a QOV Leadership meeting in July. The blocks were collected at this week's guild meeting. There is still time to participate in this nationwide project. Just visit the QOV website for information, choose a free pattern, and find an official Under Our Wings quilt shop close to you that is taking the blocks. You can replenish your fabric stash at the quilt shop while you're there.